Recent release “From the Past to the Present,” from Page Publishing author William Hodge, is both enlightening and entertaining; this work explores the ideas of personal identity, faith and courage. 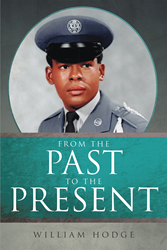 William Hodge, a veteran, husband, father, grandfather, great-grandfather, sports and music enthusiast, Christian, fisherman, devoted writer and author, has completed his new book “From the Past to the Present”: a gripping and potent work about life, love, laughter and acceptance. Published by New York City-based Page Publishing, William Hodge’s emotional work takes the reader on a journey through a military career. William's life began in a small town in Axton, Virginia, on his grandfather's farm. William grew up with his brother Howard and they played different games during their childhood. William attended several elementary schools and later high school where he graduated. He had a successful military career where he served for twenty-four years. He met his wife Beulah at the start of his military career in 1970. They were married in October 1973. William and Beulah traveled to different states during his career. William was also in different countries during his career. He retired from the military on 1 June 1993. This book covers his life from childhood to adulthood. William spent a large part of his life in the military. During those years they were moving from state to state after serving time at one location. William served in foreign countries that his family could not be with him. The title of this book describes William's life from the past to the present. William and his wife Beulah continue to remain active and enjoy life. Readers who wish to experience this profound work can purchase“From the Past to the Present” at bookstores everywhere, or online at the Apple iTunes store, Amazon, Google Play or Barnes and Noble.